I've been twice now with my nephew, Nicholas. It's his Sunday night haunt and actually I couldn't think of a better place to usher out the weekend when you're in town. Boston's Island Creek Oyster Bar is located at the Hotel Commonwealth in Kenmore Square. This candlelit bar and restaurant bears the same name as the delicious oyster that's farmed in Duxbury, Massachusetts. Skip Bennett started his oyster farm with a dream to "grow the world's finest oysters and have the best possible time doing it" and lucky for us he teamed up with Jeremy Sewall and Garrett Harker to open this restaurant which adheres to that same mission. They work closely with purveyors to find the best oysters and freshest seafood that's available daily. They also feature top quality meat entrees for those who prefer eating from the land. The staff is knowledgeable about every aspect of the menu and will guide you through your selections to ensure you have an superb dining experience. It's a hip, rustic decor with a slew of candles gracing the tables and the bar. We ate at the bar which is what you do when you're hanging out with Nicholas. Sunday night is especially nice as the place is full, yet not crazy crowded like a weekend night. 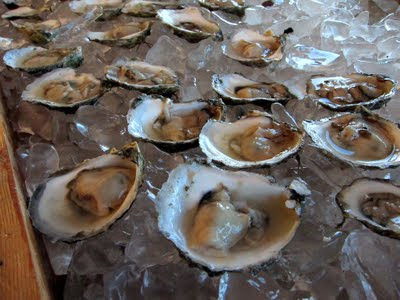 We started with a dozen of a newly featured Island Creek oyster called Tumblers. They're a bit smaller than the original and Nicholas tells me, "they grow them on a line that constantly rotates, very slowly, making them tumble over each other as the line turns". I don't begin to know the science behind it, but I can tell you that this process produces one sweet, briny delicious oyster. While I encourage you to try a selection of the oysters they feature on their menu, don't forget to include these little gems. We shared a prawn entree (it was a special that evening) and roasted corn. Next it was on to the appetizers which seems kind of backwards, but it worked. The Crispy IC Oyster Slider was so good I could have eaten a half dozen, but I needed to save room for the Pan Fried Jonah Crab Cake which was outstanding. The standard menu fare never disappoints and the nightly specials are always enticing. Our bartender was attentive and surprised me with a lovely French white burgundy which happens to be one of my favorite wines. That's just how the evening went...one delightful surprise after another. Stop in, you'll be glad that you did. Here's a link to my post from last year's Island Creek Oyster Festival. It was my first encounter with these delectable little gifts from the sea.